Keith Haring was born on May 4, 1958, in Reading, Pennsylvania. His parents, Allen and Joan Haring, raised Haring and his three sisters in Kutztown, Pennsylvania. As a child, Haring was fascinated by the cartoon art of Walt Disney and Charles Schultz and the illustrations of Dr. Seuss. He spent many hours drawing with his father, an engineer whose hobby was cartooning. After graduating he decided to move to New York City to enroll at the School of Visual Arts. Haring arrived in New York, it was home to a thriving underground art scene. Haring befriended fellow emerging artists like Jean-Michel Basquiat and Kenny Scharf, who shared his interest in the colorful and transgressive graffiti art of the city’s streets. Haring and these other artists organized exhibitions at downtown nightclubs and other alternative locations, where art, music and fashion all came together in a dynamic mix. Haring began using the city as his canvas. Riding the subway, he noticed the black paper rectangles of empty advertising panels on station walls; using white chalk, he began filling these black panels with simple, quickly drawn pictures. His signature images included dancing figures, a “radiant baby” (a crawling infant emitting rays of light), a barking dog, a flying saucer, large hearts, and figures with televisions for heads. These graffiti drawings attracted the attention of New York commuters, as well as the city authorities: Haring was arrested for vandalism on numerous occasions.Haring soon began to apply his universally recognizable imagery to freestanding drawings and paintings. The energy and optimism of his art, with its bold lines and bright colors, brought him popularity with a wide audience. He had his first solo exhibition in 1981, at the Westbeth Painters Space in Manhattan. In 1982 he began to show his art at the Tony Shafrazi Gallery, which would represent him for the rest of his career. 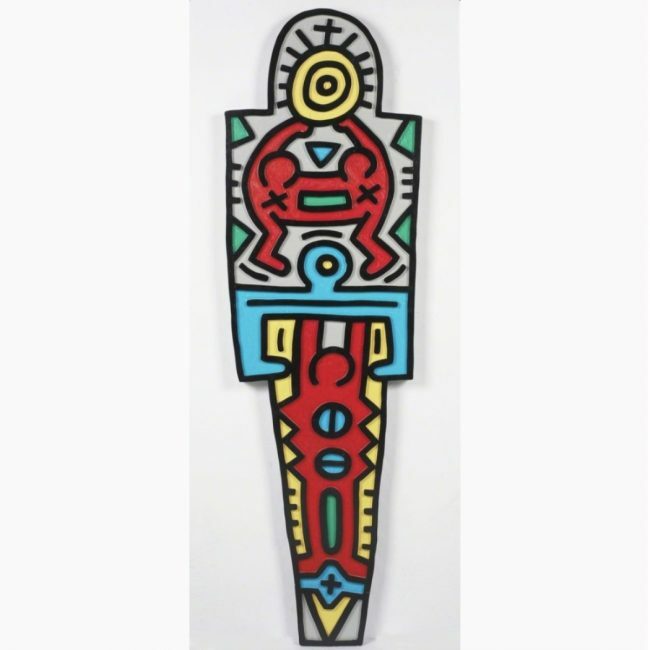 Throughout the 1980s, Haring’s work was exhibited widely both within the United States and internationally. He also collaborated with other artists and performers, including Andy Warhol, Grace Jones and William S. Burroughs. Always wanting to make his art more accessible, Haring opened a retail store called the Pop Shop in New York City’s SoHo neighborhood in 1986; the shop sold posters, T-shirts and other affordable items featuring Haring’s signature designs. Over the brief span of his career, the artist completed more than 50 public works, including the anti-drug mural Crack is Wack in a Harlem playground and an illuminated, animated billboard of his “radiant baby” image for New York’s Times Square. He also hosted numerous art workshops for children. In 1988, Haring was diagnosed with AIDS. The following year, he created the Keith Haring Foundation to support children’s programs and organizations dedicated to raising AIDS awareness.He died of AIDS-related complications on February 16, 1990, at age 31.